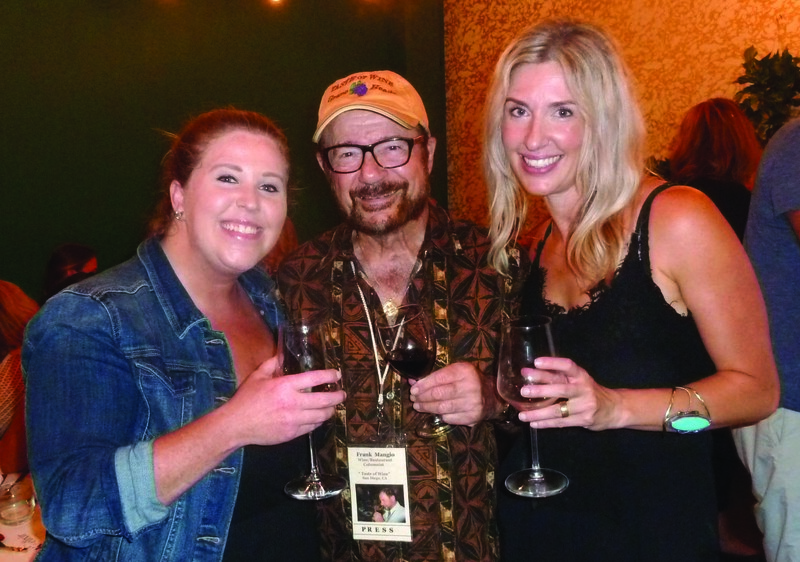 The New Oak + elixir Wine, Beer and Eatery in Carlsbad Village had its first wine event recently and columnist Frank Mangio met part-owners Annie Rammel and Rebecca Braun, who introduced Aviary wines of Napa Valley and Alpha Box & Dice from Australia. This beverage shop replaced RELM on State Street and is devoted to finding great discoveries. Annie Rammel and Rebecca Braun from the new Oak + elixir in Carlsbad Village, with wine columnist Frank Mangio. The Aussies brought in some low production, late year vintage pouring that set the tone for a new approach in Australia, low production with offbeat varietals like a 2016 Tarot Grenache from the McLaren Vale district ($17) and a 2015 Golden Mullet Fury white, also McLaren, with Semillon and Voignier ($20). The Aviary Cabernet from Napa Valley was even more incredible with a 2015 vintage ($19). The kitchen put together some flavorful small bites, with cheeses, charcuterie, flatbreads, salads and a lot more. A feature of Oak + elixir is the weekend “Happy Hour” from 4 to 6 p.m. Two dollars is taken off any glass on the menu. More than 30 wines are by the glass. See more at oakandelixir.com. The craft beer capital of America is now San Diego, home to more than 125 licensed breweries at the start of 2017. North County accounts for the most. Craft beer is a big, muscle business with more than $851 million in sales and 4,512 workers. According to San Diego Metro News, the largest brewery is Ballast Point, producing 300,000 barrels a year. It’s been on a tear since being bought out be Constellation Brands for $1 billion dollars in 2015. Cal State San Marcos now has “Brewchive,” a comprehensive exhibit of San Diego’s brewing history, in its library with signature collections. Learn more at brewchive.com. Wine Spectactor recently published a sympathetic article on Merlot, tracing its downfall to a glut of the second most produced varietal in the mid 2000s and a stab in the back from the movie “Sideways” about 10 years ago. Sales plummeted to this day without recovery. A close look at the worldwide implications of Merlot reveals that it’s the most widely planted grape in France where it comes from, and in Italy, where it is used in the very popular Super Tuscan wines. The French prefer it on the right bank of the Bordeaux district, in Pomerol and St.-Emilon. Its most famous brand is Pe’trus where older vintages can be priced at $5,000 and up. A Napa Merlot that I look for is the Rombauer 2013 Carneros Merlot, rich and silky with smooth tannins ($30). Napa Valley’s Whitehall Lane teamed with Vittorio’s for a four-course dinner. Jordan Mungin of the Estates Group and Vittorio’s owner Victor Magalhaes presented the top shelf brand, Tre Leoni 2014 Red Blend ($25). The name represents three generations of the Leonardini family, owners of the winery. Get the full story at whitehalllane.com. Vittorio’s is in Carmel Valley off the 56 freeway. 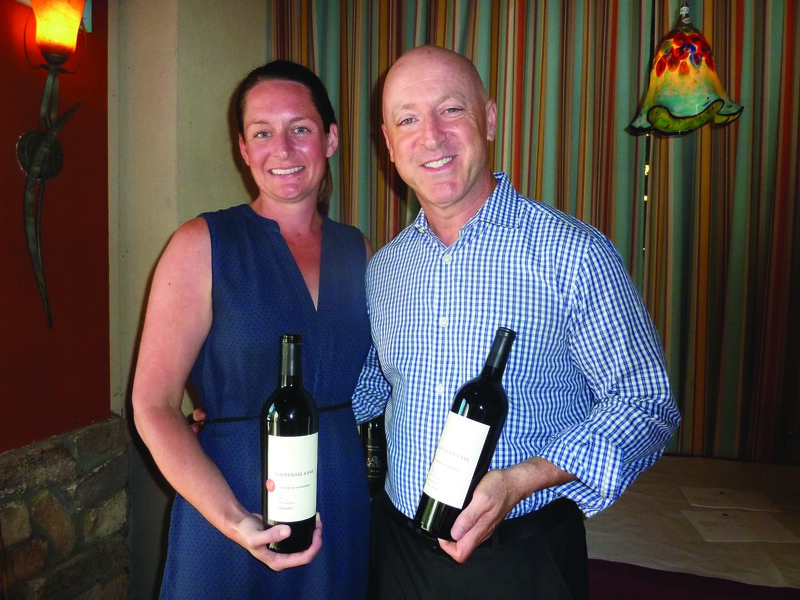 For news on their latest wine dinner, call (858) 538-5884. • The Ramona Grape Stomp happens from noon to 5 p.m. Sept. 9 at the Ramona Outdoor Community Center. You can squish grapes in competition with prizes awarded and taste wines from Ramona wineries. Check out the food and other vendors as well. Adults tickets are $10, kids 6 to 12 are $5. Buy at ramonagrapestomp.com. • Lorimar Winery in Temecula has its Grape Stomp and Harvest Festival from 3 to 7 p.m. Sept. 10 at the Barrel Room. Stomping, live music, costume contest, hay rides and more. Adults admission is $35 and kids are $25. For dinner, adults are $30 and kids are $20. Go to lorimarwinery.com for tickets. • A Tasting Tour of Spain is a comprehensive class with wine, cheese and charcuterie, at Meritage Wine Market Encinitas from 6 to 8:30 p.m. Sept. 12. Wine regions will be explored with lots of opportunity to taste the varietals of this country. Cost is $79. RSVP now at (858) 442-2749. • Seasalt Seafood Bistro in Del Mar is presenting a Whitehall Lane Dinner at 6 p.m. Sept. 14. Whitehall Lane is one of the premier wines in Napa Valley and will be a perfect pairing with cuisine such as short rib ravioli and pink rib-eye steak. Call today at (858) 766-7100 for your place. Frank Mangio is a renowned wine connoisseur certified by Wine Spectator. He is one of the leading commentators on the web. View his columns at http://thecoastnews.com. Go to menu then columns. Reach him at mangiompc@aol.com.